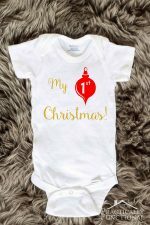 There are only four months left until our baby is due, and I’m starting to get really excited about baby things! 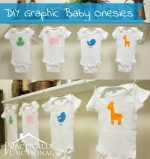 My family made a bunch of super cute onesies for me at my baby shower, and I’ve started buying a few things, but I’m most excited to start setting up the nursery and doing baby-related crafts! So when Fabric Creations™ asked if I wanted to try out their new Soft Fabric Ink, I knew it would be perfect for the Moby wrap I bought second-hand from a mom in my Chicago-area swap group! 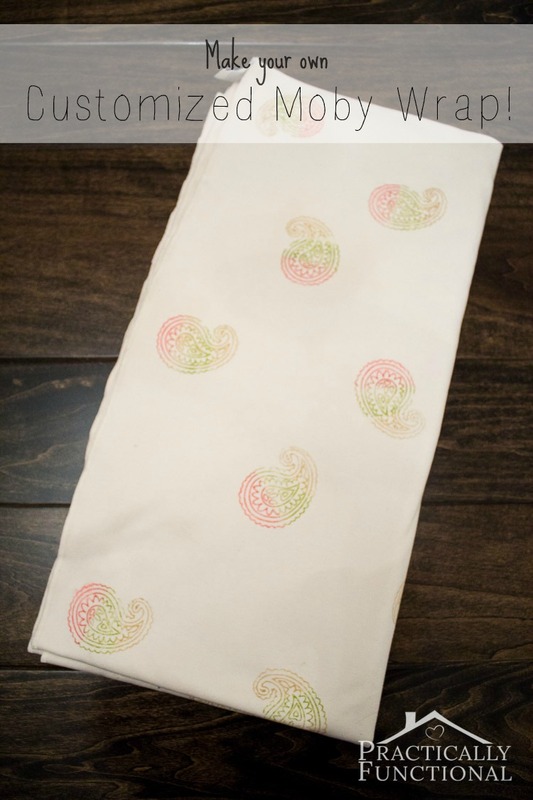 Check out this awesome DIY stamped Moby wrap I made! I’m really excited to start using this wrap; it’s going to be the perfect way to carry the baby around with me while still allowing me to use my hands. 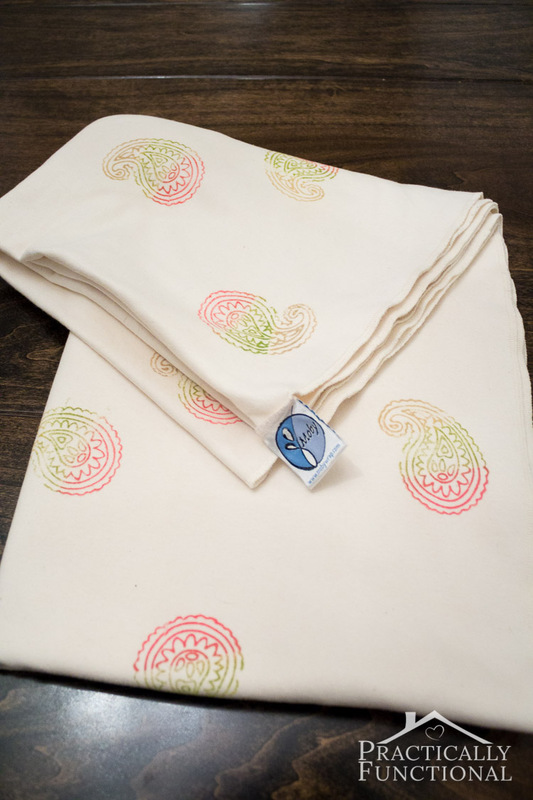 And this soft fabric ink is great for making unique, handcrafted textile projects, so I knew it was the perfect way to turn the plain ivory wrap into something fun and customized! 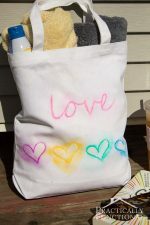 It’s designed to be stamped, stenciled, or brushed onto fabric; the fabric ink is waterbased and non-toxic, and after it’s set, it’s completely machine washable! 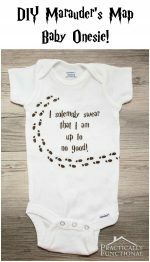 Perfect, because you know baby things get spit up on all the time! 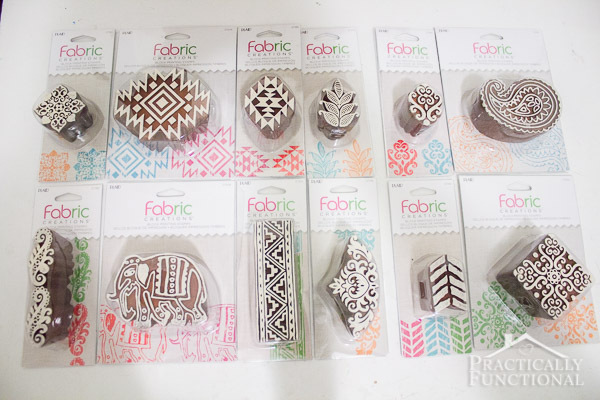 Fabric Creations Block Printing Stamps and Fabric Ink are available at Hobby Lobby and www.plaidonline.com. I only used the paisley block printing stamp, but Plaid sent a bunch of stamps and they are all super cool. I love the funky, tribal vibe of the whole collection! 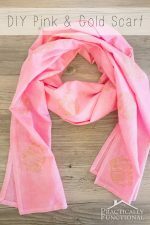 The soft fabric ink comes in a bunch of different colors, plus you can easily mix the colors to create your own custom colors if you want! If your Moby wrap is brand new, start by washing it. You should always wash your fabric before crafting with it, just in case it’s going to change shape or size in the wash! Then squirt out a bit of fabric ink onto a paper plate, dab the sponge into the fabric ink, and use the sponge to apply ink to the stamp. 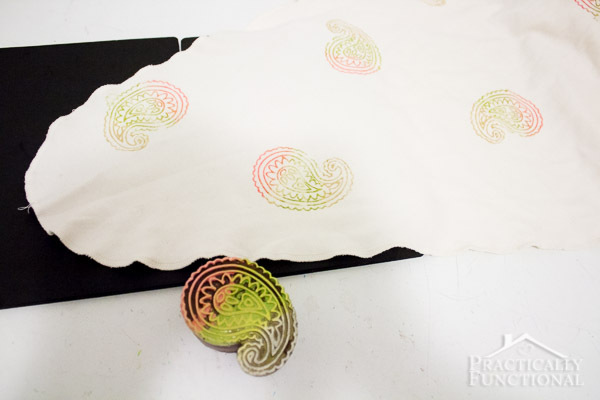 You only need a very light coat of fabric ink on the stamp for it to work, so you don’t want to push the stamp directly into the fabric ink or it will fill in all the divots on your stamp and mess up the clean lines. 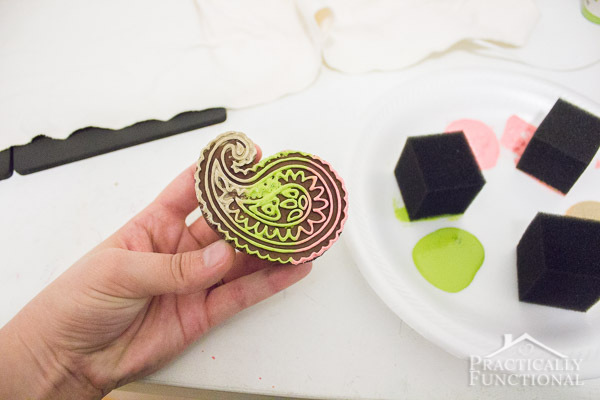 If you want to mix, match, and combine colors on the stamp itself, you can totally do that! 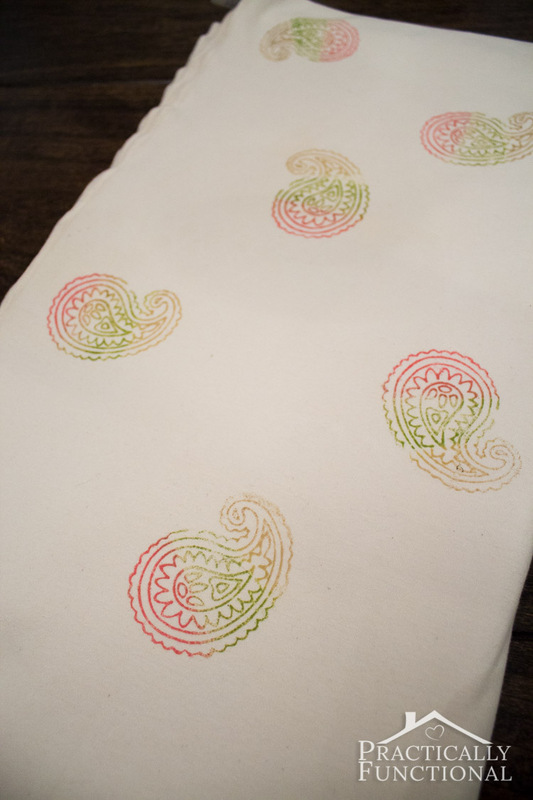 I thought a three toned paisley design would look pretty cool so I sponged all three colors onto the stamp before stamping it onto my fabric. 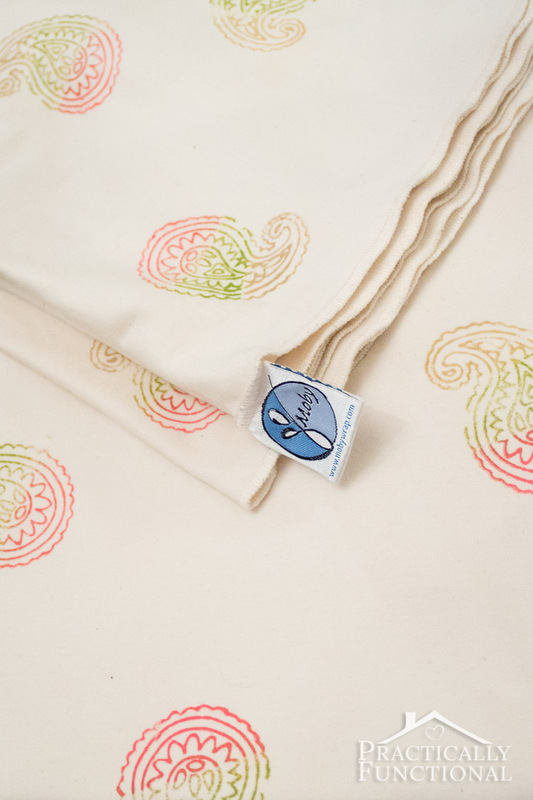 After your stamp is covered in fabric ink, place the soft stamping mat under your Moby wrap, turn the stamp over onto the wrap (making sure it’s on top of the foam mat! ), and press down. There’s no need to rock the stamp or anything like that; the foam mat makes the perfect sturdy yet slightly soft surface for stamping, so you’ll get a clean stamp every time! In order to keep your design consistent, I recommend applying more fabric ink to the stamp every time, rather than trying to stamp multiple designs all at once. You can test it out on a scrap piece of fabric if you want, but I found the second stamp was extremely light and hard to see, so I reapplied fabric ink every time. 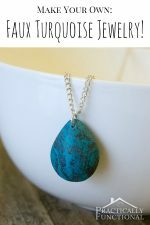 Keep stamping until your wrap is covered! 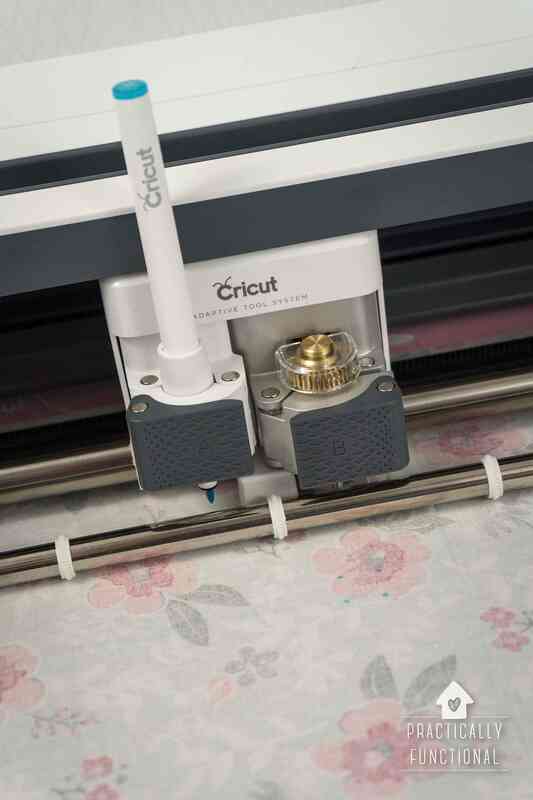 The ink dries to the touch pretty quickly if you don’t do too heavy of a coat, but you do need to let the ink cure overnight and then heat set it before you use your custom fabric creation. But don’t worry, heat setting is easy. 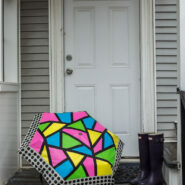 Just let the project dry overnight, then turn on your iron to the highest setting allowed for your type of fabric. Place the project on your ironing board, cover a stamped area with a dry press cloth, and firmly press the iron into the press cloth and project for about thirty seconds. Make sure your iron is dry; no steam! 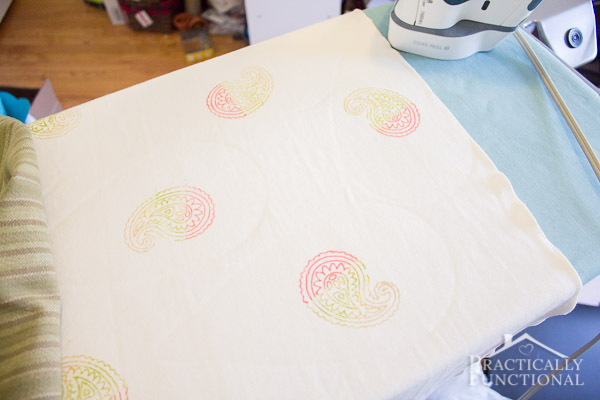 Then move the iron and press cloth to the next stamped area and repeat until you’ve pressed all of your stamped areas. And you’re done! The fabric is now washable and ready to use! I’m really excited to start using this gorgeous wrap when the baby gets here! 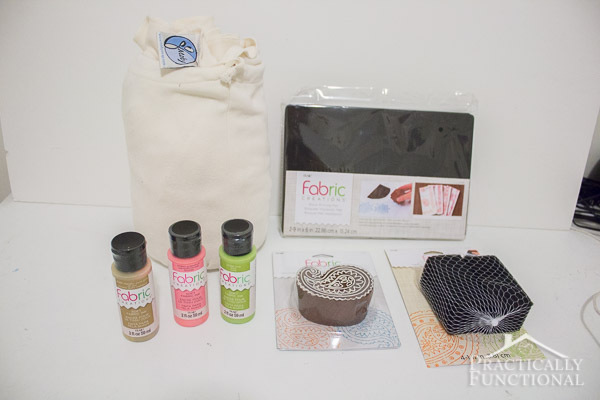 And, I’m excited to do more projects with this fabric ink! 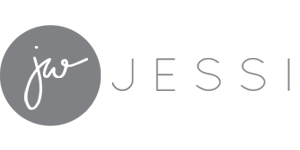 You can use this ink and these stamp blocks for anything and everything: fashion, quilts, textiles, stitching embroidery, scrapbooking, printing, etc. 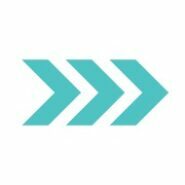 For more awesome project ideas and special offers, follow Plaid on Pinterest, Facebook and Instagram. 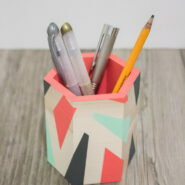 If you liked this project, check out these other simple paint crafts! AWE! 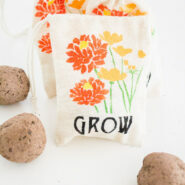 These are just darling! I love the stamp and the colors. Very Clever! This is a great idea to customize your own wrap. Pinned.